You could hear a sharp intake of breath from subwoofer aficionados when REL announced its home theatre-centric HT series (or, rather, Serie HT, to give it its full pretentious moniker). Gone was the signature REL high-level input, long considered a USP of the brand's product stable. So what was on offer? A simple filter network, a budget finish and a promise to deliver a big bang for very few bucks. It was a great idea, and nearly enough for me not to mention that it should have been called the Home Cinema series, or Serie HC. Oops, I mentioned it. I rather liked the entry-level HT/1003. At just £500, its punchy 300W Class D amplifier, 10in CarbonGlas cone woofer and compact sealed cabinet brought home the value LFE bacon. Scaling up the design into a larger cabinet, boosting power to 500W and deploying a 12in driver is an obvious step up. This is what REL has done with its HT/1205, which comes to the table at just £700, making for a very attractive spec sheet for the money. Tipping the scales at just shy of 20kg, the HT/1205 is no lightweight for a near 40cm cube, thanks to the heavyweight cabinet construction and bold (forward-firing) driver. Its cubic shape, textured vinyl wrap and shiny top-plate make for a serious yet understated aesthetic. That top-plate is a neat nod to RELs of old and, unlike my old Stentor, this panel is fixed so won’t leap off during moments of huge LFE. On the underside, the sub's four MDF feet are threaded for spikes. Given how much my HT/1205 sample shipped itself across a smooth floor without them, spikes or rubber pads will be essential. Custom designed by REL, the 12in CarbonGlas cone is said to be super-light and super-rigid. Those are the magic ingredients for fast transient attack and a tight sound. The soft butyl rubber roll-surround is a REL hallmark, offering long-throw excursion while remaining flexible for donkey’s years. The sealed cabinet design adds back-pressure to the cone movement, further keeping the output drum-tight but lacking the port-assisted bass gain of open designs. That is overcome by throwing power at the problem. The 500W Class D amplifier here is also a REL design, dubbed NextGen5, and said to be cool-running and compact enough to allow for plenty of internal cabinet volume. The upshot is a claimed 22Hz (-6dB) frequency response and the ability to go party-loud. 'Warn the neighbours,' suggests the company. Compared to more traditional RELs, the HT/1205’s rear panel looks near-deserted. There are just two switches (On/Off/Standby, and 180-degree phase), and knobs for level and crossover. Inputs are just two phonos with unfiltered loopthrough, although REL’s funky little HT-Air unit will give you wireless connectivity for a further £100. You could use the HT/1205 as a stereo music sub connecting the twin phonos to an amplifier pre-out but that would be rather missing the point. Setting up the HT/1205 isn’t all that different from most REL subwoofers save that lack of a high-level connection and the potential for a simultaneous input. Using a single LFE cable, I moved the sub around (the relatively compact design is useful here) while playing music material with a constant bass beat, settling on the position and phase that delivered the most perceived gain. Peering down the back of the HT/1205 reveals the connection and control legends are also written upside-down to make them easier to read. Given I need glasses and a torch to see any legends these days, that touch was rather lost on me, but it shows an attention to detail. My only criticism of the very manual setup is the smooth finished knobs for level and crossover. If they had an indent or raised line to mark where set, you could better ‘feel’ where they were pointing. A remote control (or smartphone app) would be even better, but would have bumped the price up well above £700. Cutting to the chase (scene), the HT/1205 delivers an astonishing level of home cinema thunder for the money. If you want big LFE without dipping into four-figure sub territory, this is a smart place to look (and I suspect a pair of HT/1205s, for £1,400, would be frankly seismic and deliver giant-killing fun). On the flip side, the HT/1205 was clearly playing hooky the day the subtlety circuits were being handed out. With Scarlett Johansson diving into the Dolby Atmos-fuelled festival opening fight sequence in Ghost in the Shell, (Blu-ray), the HT/1205 is in its element. Gunfire thumps into your chest with a percussive feel and the subwoofer never seems to lose its grip even at serious volumes. My main speakers went into HF compression long before the HT/1205 was done, inspiring some enthusiastically LFE-biased level-matching on my AV rig. That in itself naturally led to seeking out The Expendables 3 on Blu-ray. I just love the scene in the dockyard when our heroes see Stonebanks (Mel Gibson) for the first time. Gunfire from ten different types of weapon (including a rocket launcher), explosions and toppling cargo containers see the LFE channel on fire and the HT/1205 does not disappoint. It is fearsomely dynamic with a sledgehammer punch around 50Hz-60Hz that can take your breath away. It revels in the mayhem, keeping taught rather than boomy and delivering bass fun in spades. Job done. Yet the escape sequence in Skyfall (Blu-ray) shows up the HT/1205 as a little, well, gung-ho for subtler effects. The low bass beat throughout the beginning of the scene is designed to replicate Bond’s rising heartbeat as he realises Silva has escaped. By the time Craig is running through the tube station, the beat is a fast-tempo rhythm. Here, the HT/1205 lacks the refinement of woofers like REL’s own T7i and the LFE is a little more 'one-note' than ideal. Backing down the gain softens the effect, but also robs the HT/1205 of some of its visceral edge when the action starts. Perhaps I'm guilty here of demanding too much. Despite its absence of true LFE subtlety, there should be no doubt that the HT/1205 is a bass-making bargain, and it offers a notable upgrade over the smaller HT/1003 for just £200 more – that model doesn’t go as deep or loud, but is a little easier to integrate into a more compact movie room. 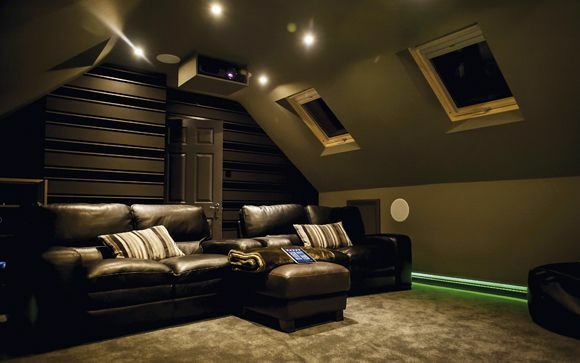 And, anyway, this is home cinema and we like it big, bold, loud and not too expensive. REL's HT/1205 fits that billing nicely. We say: Enormously powerful for the cash, REL’s neat-looking HT/1205 delivers outstanding bang per buck, but don’t expect too much subtlety.